A series of 9 mind-provoking illustrated talks, complete with audience participation and hypnotism demonstration. AD-0509 "Hypnotize yourself to Reduce Weight". Chooi-Chin Goh BA (Hons), MSc Multimedia, Certified Hypnotherapist. 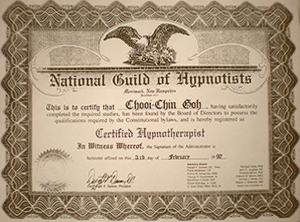 Ms.Chooi-Chin Goh was instrumental in introducing the benefits and efficacies of hypnotism to the Malaysian public in June 1994 by bringing in the some of the world's most eminent and renowned hypnotherapists to teach and promote the Transforming Therapy. Personally trained by Dr. Gil Boyne (dubbed as the 'Father of Hypnosis', California, USA), Gerald Kein of Florida, and other renowned experts of the field, she holds certifications of Master Hypnotist and Diploma of Hypnotherapy. She is a Certified Hypnotherapist, was a Member of the Florida Society of Professional Hypnotherapists and a Member in Good Standing of the National Guild of Hypnotists, Merrimack, New Hampshire, USA. Ms. Goh, a resource speaker with Vistage.co.uk, (The World’s Largest CEO Membership Organization) is a dynamic motivational speaker! She has some of the highest speaking evaluation ratings in the CEO membership circuit through TEC Asia. 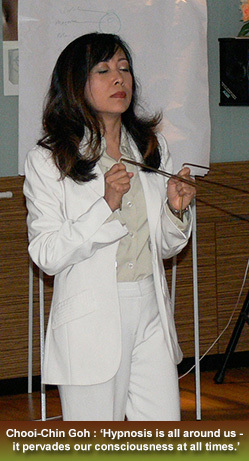 Specializing in the auto-suggestive sciences, she runs workshops and presented talks and demos about the power of the mind to the corporate, medical, education and public sectors with eye-opening demonstrations to wide ranging sophisticated audiences in Malaysia, UK, US, Thailand, Singapore, Indonesia, Vietnam, Kenya, Sri Lanka and the Philippines. She was a Director of MDK PR Consultants S/B of the WPP Group of companies which is one of the world's largest communications group, and a Business Innovation Consultant to spiritual & health tourism projects, serving as mentor to planning committees, while functioning as interpretive master planner with CEO/Founder, in generating, building and implementing visionary ideas. A UNICEF consultant, she Is also writing and developing her own spiritual 6-star spa resort project, called the Aesculapian Sanctuary, a sustainable, free energy technology powered SQ centre. Experienced in idea-generation with business solutions, she has multifaceted expertise in communications, advertising, PR, media planning, marketing strategies, business development, research, coaching and training abilities with outstanding interpersonal, motivational and presentation skills. She represented Malaysia as a Main Speaker for the 26th IFTDO Conference (International Federation of Training and Development Organization). She is the official Malaysian Co-creator of the Earth Rainbow Network. She also represented Malaysia as a main speaker in the Silver Dove Congress 2000, Chiang Mai, Thailand, February, 2000. This holistic lifestyle congress brought in renowned speakers from 18 countries. 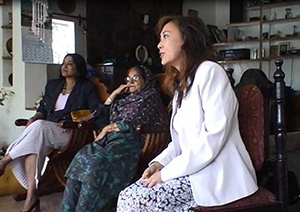 As a consciousness activist, she was the Founder of the Malaysian United Religions Initiative Kuala Lumpur (URIKLCC), Vice-Chairman of the Interfaith Spiritual Fellowship (INSaF), Vice-President of The British Graduates Association, Malaysia (BGAM), Hypnotherapy Chapter Leader for the Malaysian Society for Complementary Therapies (MSCT) and International Chapter Representative for Malaysia & Wales, National Guild of Hypnotists, USA. Our special Talks not only introduce the nature of hypnotism by our dynamic international caliber speaker but also demonstrates its magical and amazing power and beyond into Spiritual Intelligence!